Do colors affect your appetite? That’s what the experts say. They say blue and gray suppress the appetite by being soothing and reducing anxiety. I don’t buy it with blue. (think Blue Plate Special). They say intense deep reds increase blood pressure and appetite and that is why so many restaurants have red walls. Now I have to check out the wall colors in restaurants before I order? I can hear me now: "Your walls are painted a beautiful red, that means I am not really hungry, your walls just want me to think I am hungry, so I will skip the appetizer and have the small salad while I stare into the blue of my husband's eyes because blue is going to calm me and keep me from eating too much." The experts in color and appetite say orange is both invigorating and soothing and that it brings more oxygen to the brain . . .but obviously not enough to know that the color is also stimulating our appetite. Think about that the next time you see those orange Cheetos, orange crackers or orange peanut butter cup wrappers. Come to think of it, why are peanut butter cup wrappers orange. Someone knew what they were doing. They say yellow makes you happy and helps you concentrate. Remember the yellow lined paper in school? How about the yellow lights on the road? They also say that green is relaxing and calms you down. That is funny because I think green plates and bowls make me eat less. Dark, dull greens I mean. Cheery light greens do not seem to stop me from licking the plate clean. Not mine, but I wish it was! Do the photos on this page make you happy - or hungry? Turquoise and aqua make me happy - very happy. Aqua and turquoise are my favorite colors (with orange/copper following in the #2 spot). Just looking at these photos I want to redo my kitchen again. 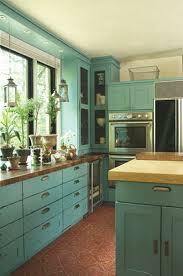 I use to have a turquoise kitchen - two different kitchens in our marriage have been turquoise. 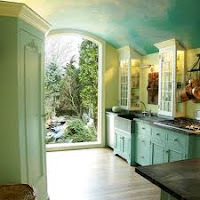 I love the aqua and turquoise kitchens (but hate red accessories in such a room. I know designers think that those two colors go together but I think the red is very off putting with aqua and turquoise. 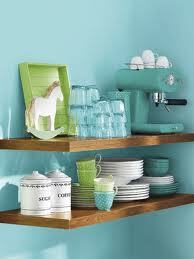 The experts say Turquoise is a great color for your kitchen if you want to gain weight. 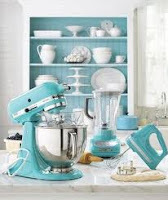 I always thought those colors curtailed my appetite BUT during the years our kitchen was turquoise I gained over 150 pounds. Hmmmm, they might have something there. . . . .
Can re-coloring our eating world help us in keeping the pounds off? school cafeteria was repainted a dark red many years ago. When we all asked why we were told exactly what you wrote - to stimulate the kids' appetites so they ate lunch.